We all want to find happiness and be free from suffering. Happiness comes from positive mental states and actions, and suffering from the opposite. The twelve-part process of dependent arising shows how actions underlain by ignorance propel us from one rebirth into another, keeping us trapped in suffering, and how through understanding reality correctly we can break this cycle. The four noble truths, the twelve links of dependent arising, and the two truths regarding conventional and ultimate reality, all interrelated, form the very core of the Buddha's teaching. The many different practices of sutra and tantra become meaningful and purposeful only when they are based on a good understanding of these fundamental and seminal principles. 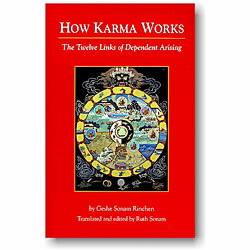 This oral teaching by Geshe Sonam Rinchen is based on the Rice Seedling Sutra and the twenty-sixth chapter of Nagarjuna's Treatise on the Middle Way. Paperback, 2006 edition, 139 pages.